I am just about finished with Code Geass' last novel, Stage 4 - ZERO. This volume covers a lot, starting from the preparation of the Specially Administered Zone of Nippon until the end when Zero and Suzaku face off. It's loaded with information, and a lot that was not covered in the anime is described. My favorite parts are the scenes between Euphy and Cornelia. There is one section where Euphy reveals to Cornelia that she plans to forgive Zero's sins by giving up her rights to the throne. An explanation is given on why there is such a privilege, and both me and my adapter thought it was quite interesting. I've said many times before, but this novel is really the best thing out of all the different ways Code Geass was told. Of course, watching the anime will help visually, but the novel fills in so much of the gaps and gives you so many insights on what all the different characters were thinking. So I'm really curious why there hasn't been any reviews on the novel. My adapter and I really work hard on this project. We do a lot of back-and-forth to figure out the best way to express what the author wrote. This isn't really about my work, but ever since I've worked on With the Light I've been following autism stuff going on in the news. Anyway, I just got an email from my local movie theater about a film called The Horse Boy. It's about a boy with autism. It's based on a book called The Horse Boy: A Father's Quest to Heal His Son. If anyone is interested, here is a list of theaters showing the movie. Also I saw in the news recently that the number of autistic kids is up. It used to be 1 out of 150, but now it's 1 out of 100. Most of it comes from broader definitions and increased awareness. Volume 5 of With the Light came out last month. If you haven't been reading the series, now is the time to pick it up! 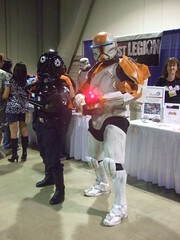 Long Beach Comic Con was today, so I went because they gave me a Professional pass. My sister, who just came back from Japan today, also came. 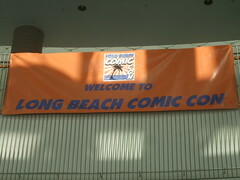 It was held at the Long Beach Convention Center, a very familiar place. 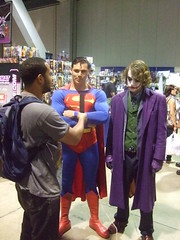 Since we went pretty late on Saturday, we didn't get to see any panels. I was a little interested in watching Trick R Treat, but my sister gets scared so I had to skip it. Basically we just went to say hi to our clients/friends. There were a lot of people there, which is good. 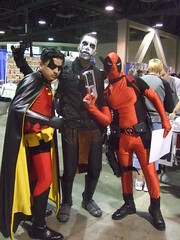 I hope they continue this convention because I'm sure some people are sick of the chaos at San Diego Comic Con.